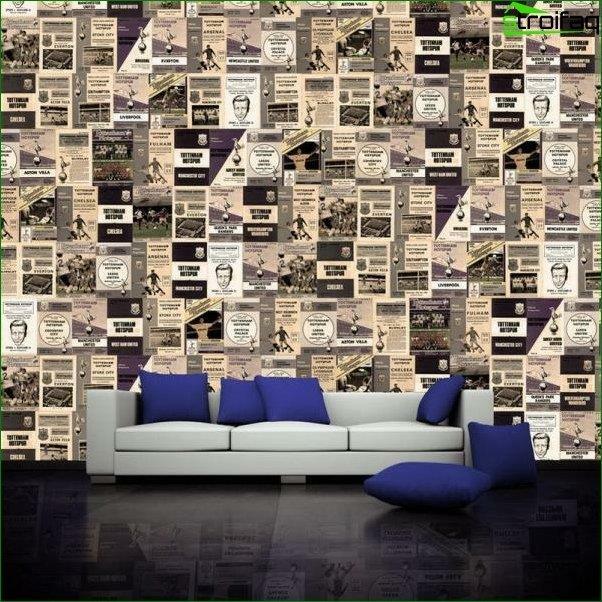 For the walls is most often used roomswallpapers, most affordable and easy to use material. 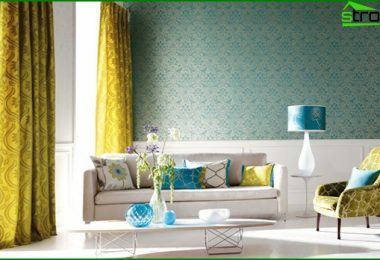 But regardless of taste and benefits should follow a few rules of selecting wallpaper, the end result pleased and not disappointed you. 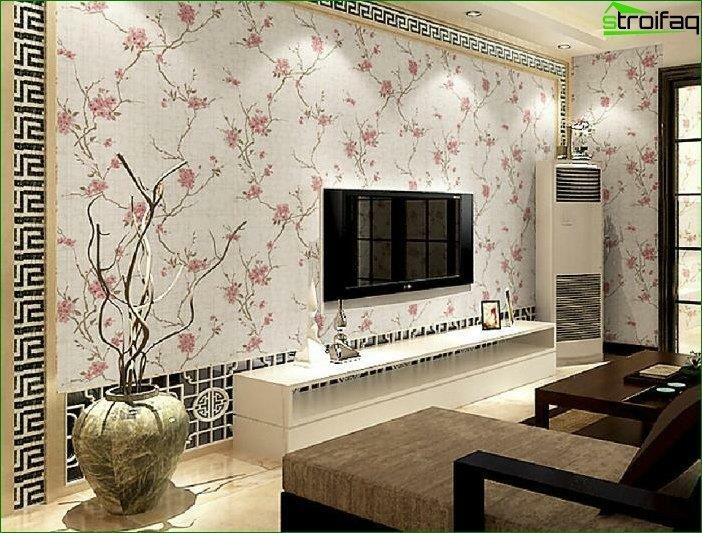 With our help, you will be able to orient in a huge range of wallpaper, pick out the most appropriate in all respects, to avoid the mistakes that often recur when glueing. paper. Most popular in the last century. However, if they were the only ones. Now they are in demand only due to its cheapness and a huge selection. 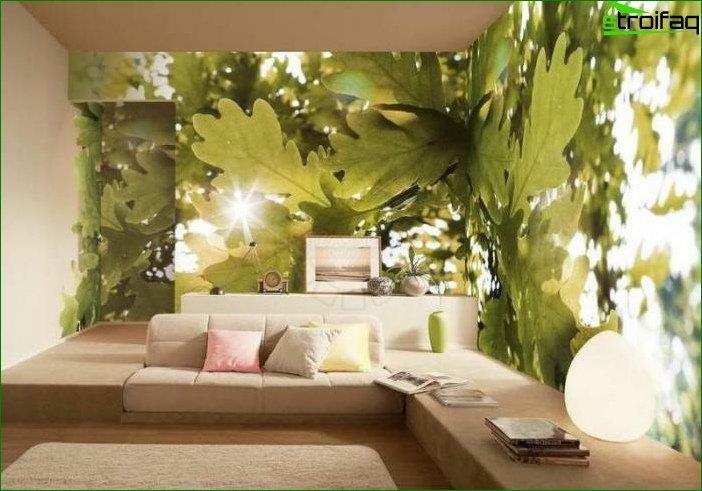 You can paste in rooms with low humidity. vinyl. 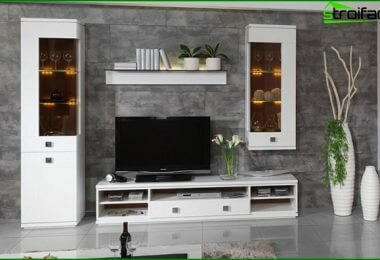 Because of its quality oftenused in the corridor and in the kitchen. 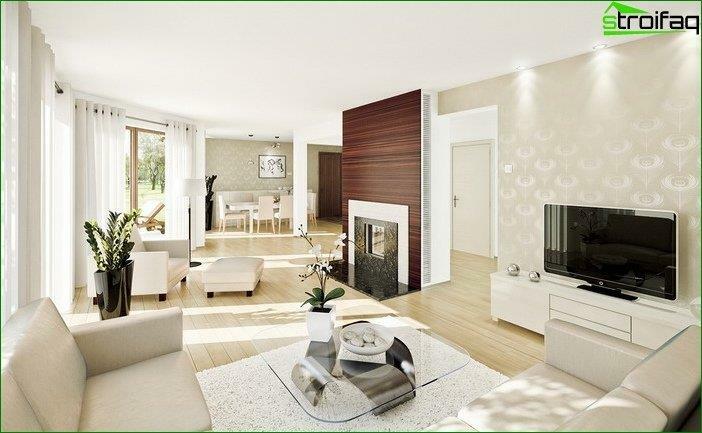 The design of the hall is rarely used because of the small range and poor air permeability. 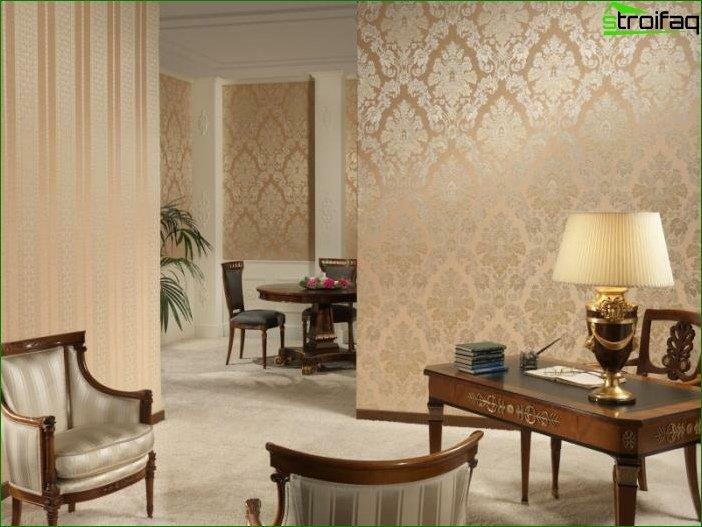 Variety - silk screen wallpaper, in which the upper layer of vinyl silk thread added. flizelinovye. The most popular modern wallpaper. Used as a stand-alone wallpaper and as a base for painting. The perfect combination of price and quality. 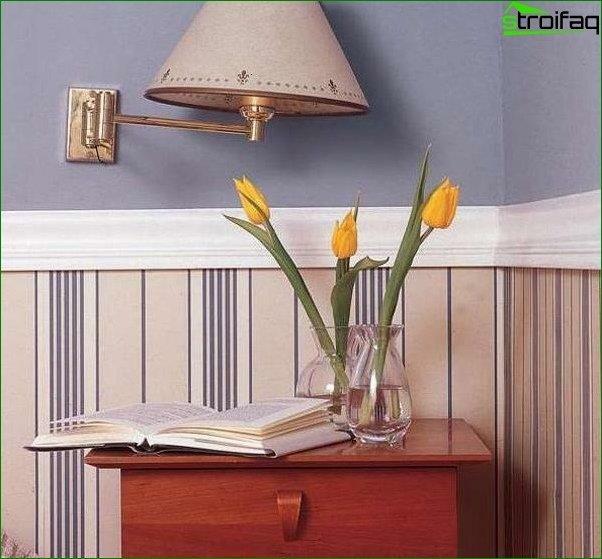 Read more about wallpaper for painting! acrylic. Alternative for price paper. And at the same time stronger and more moisture resistant. textile. Double wallpaper. On top of paper or a paper basis applied natural fabric: linen, cotton, silk. 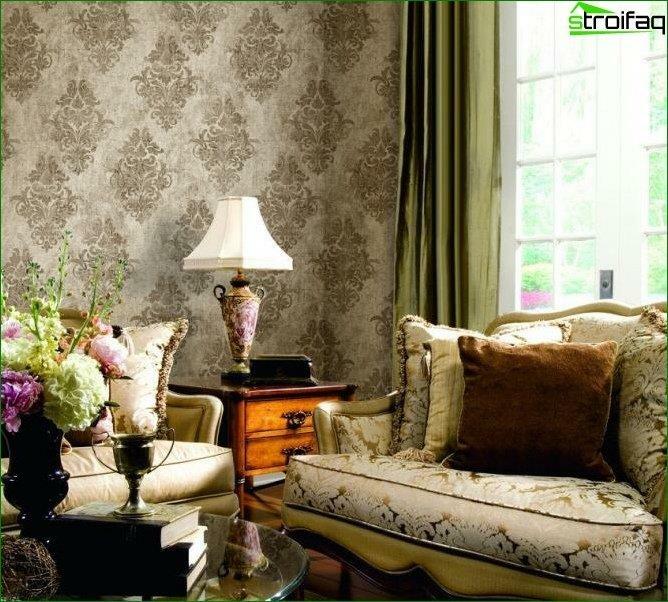 Today, there are two types of textile wallpaper - strand and the whole web. 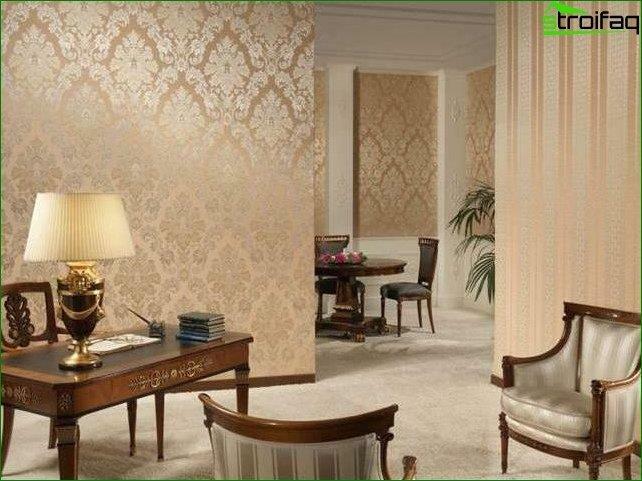 There are several varieties of textile wallcoverings: Jute; silk; linen; mats; felt. Mural. 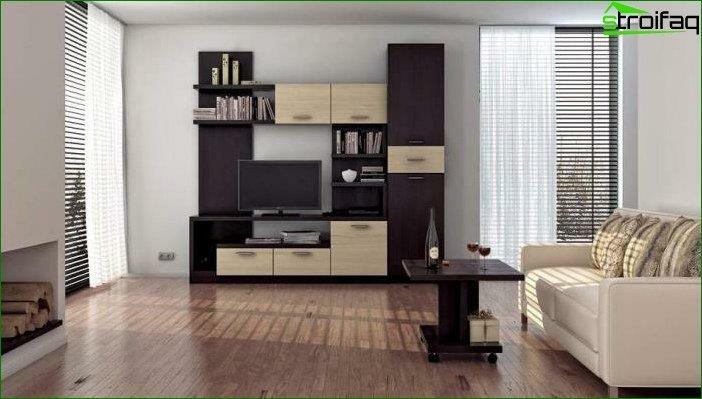 Ideal to make any room an individual and inimitable. In addition aesthetic pleasure solve many design problems in a visual editing space deficiencies. metallized. There were a protection against electromagneticradiation. Reliable shield the radiation from television, radios, cell phones behind the wall, neutralize radiation of power lines. They consist of two layers - the upper and lower paper aluminum foil. liquid. Future Wallpaper. Initially have a powder or liquid kind. Divorce latex paint and applied to the wall paint sprayer or roller. Created on the basis of cotton, pulp, textile. See more photos of the hall design. 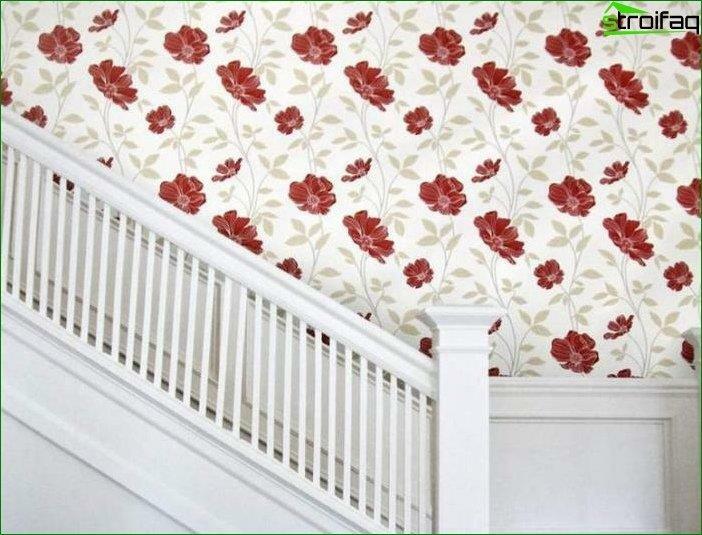 Paper Cheap, easy to glueing, large selection, hide small imperfections in the wall Quickly wash, wash, fade in the sun. Vinyl Durable, embossed, water-resistant, has a very interesting decorative qualities Expensive, heavy in glueing, airtight, have a peculiar smell, which is felt a few days after gluing. 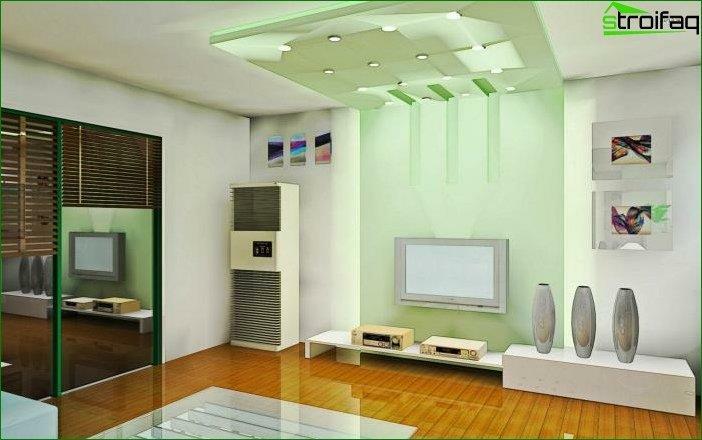 In the photo above example the room with light furniture. Wallpaper should be lighter and not "crying". Not Recommended choice of wallpaper with a large pattern. 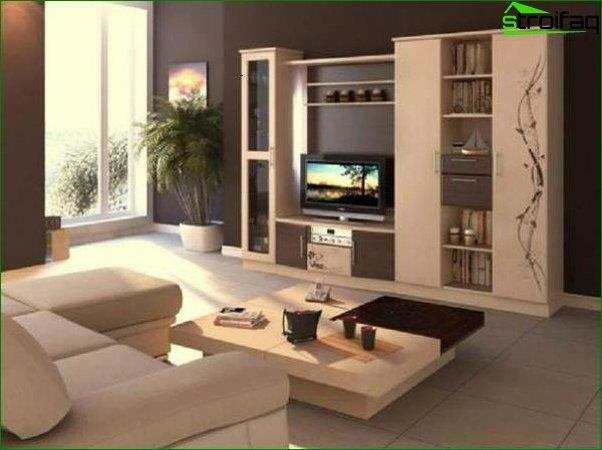 You can add accent element, color in tune with the color of the furniture. 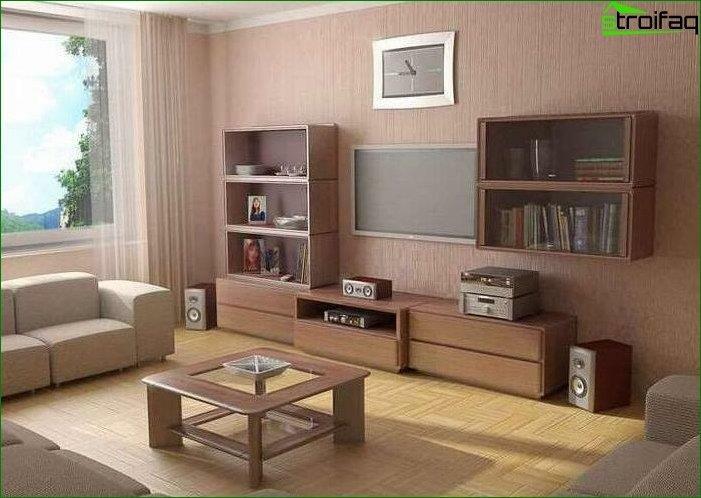 In the photo above example the room with dark furniture. Wallpapers have little to muffle it. 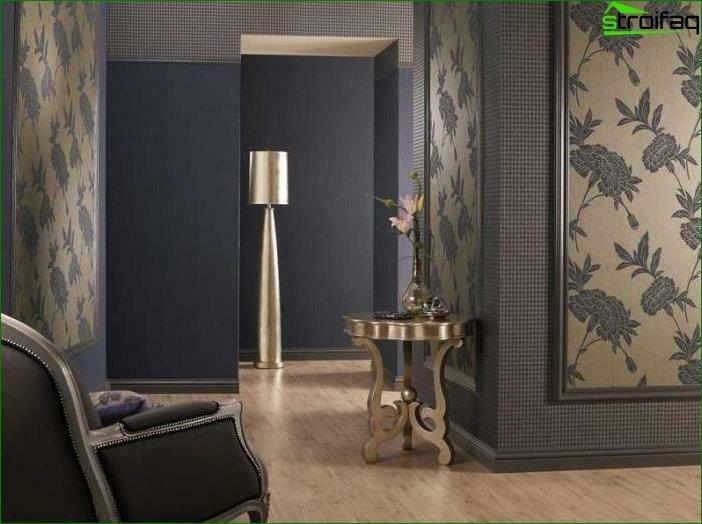 If you are a supporter of striking contrasts - use wallpaper complementary color to the color of the furniture. Then they will reinforce each other. 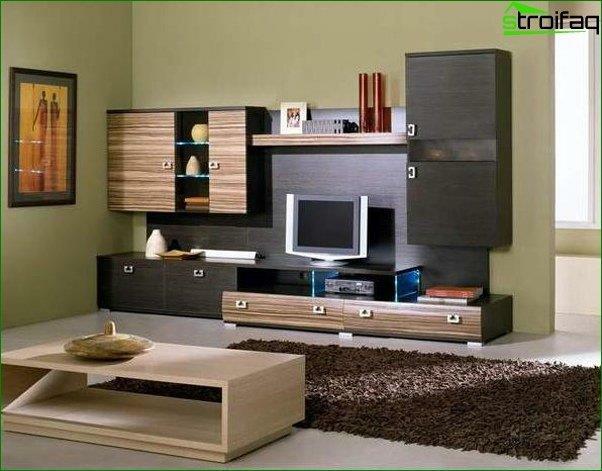 Most furniture manufacturers use in theirprojects two colors. 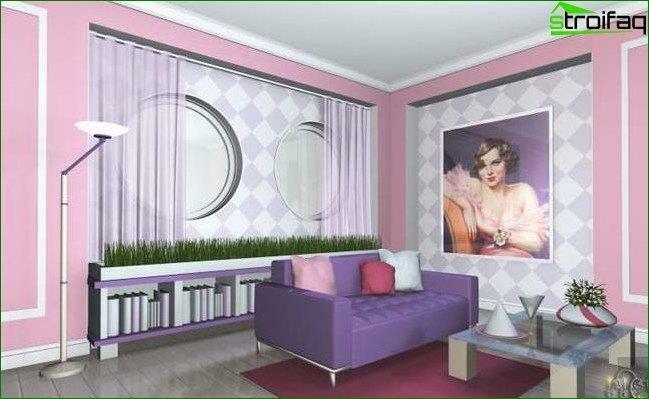 For such furniture will suit a neutral color wallpaper, a lighter, or picked up by the color of the facades. The contrasting color of the furniture housing will create an interesting effect, showing only the contours merge color facades and walls. 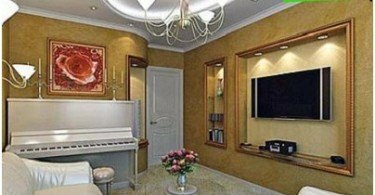 In this case, the best optionneutral gray color of the wallpaper, because the focus is supposed to be in the room at the very furniture. It is desirable that figure was small and discreet or entirely absent. 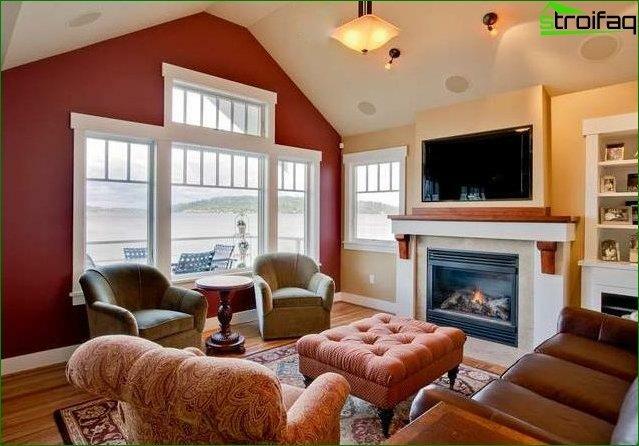 Not always room area creates a classic interior there in his textbook understanding. In this case, the aid of wallpaperWhich will accentual in the decoration andforced to doubt that we are in the classics. After all, they are different bright colors and unusual patterns: monograms, damask, royal lily floral ornament. 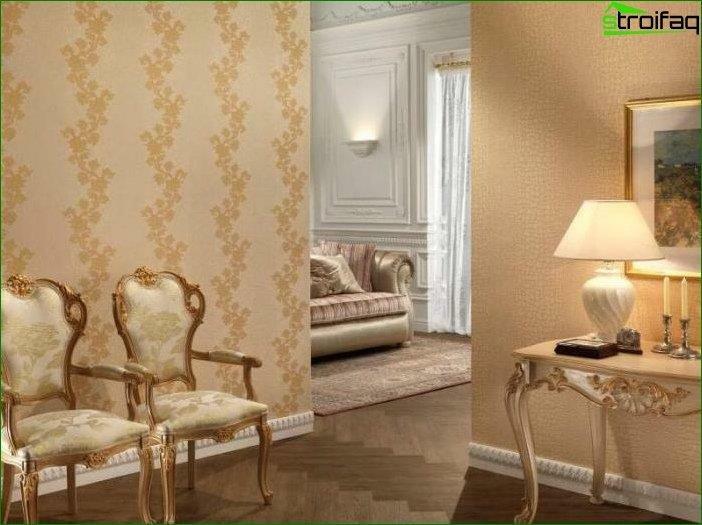 Warm pastel shades of color wallpaper art nouveau fascinating plasticity and elegance of its lines of ornaments. The most common themes: plants, wave, swans, wind. 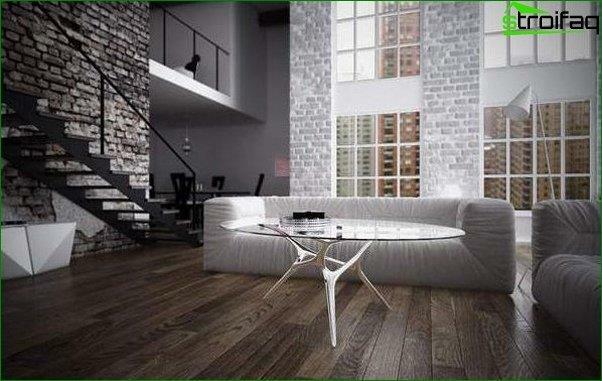 French style, so named in honor ofthe province is characterized by its simplicity and modesty. 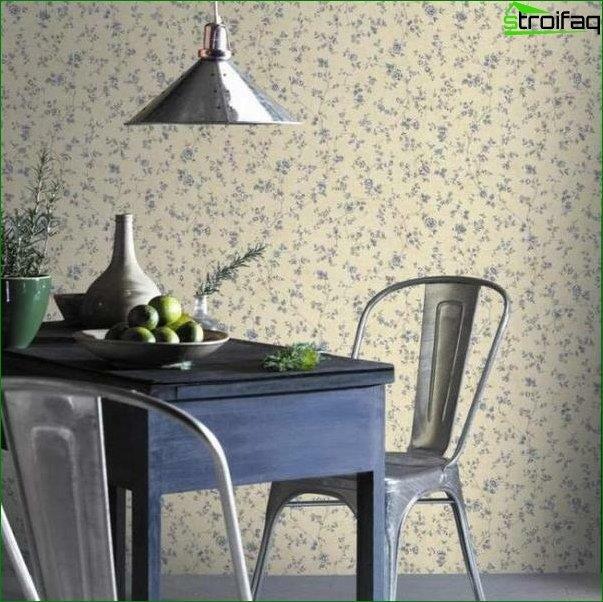 Wallpaper in the style of Provence bright, warm colors with a floral pattern, reminiscent of the old calico. Along with uncomplicated composition of all kinds of flowers and bouquets are naturally present and the similarity with the original. They are characterized by an abundance of sunshine and cheerfulness. In English, this style denotesattic. 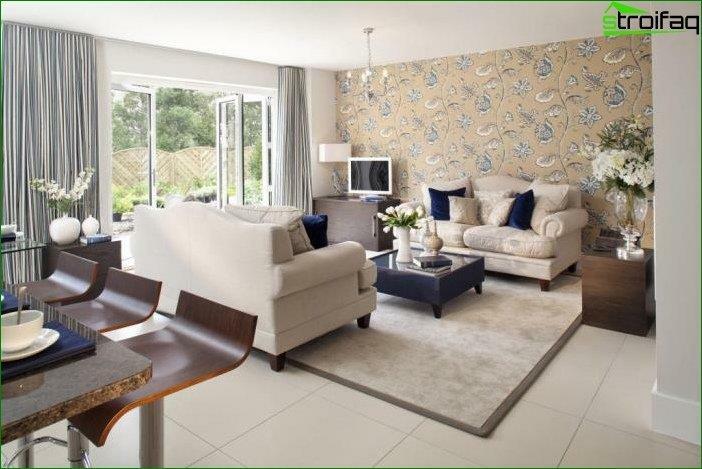 The task of wallpaper in this style to create an atmosphere of old walls, contrasting with modern furnishings. 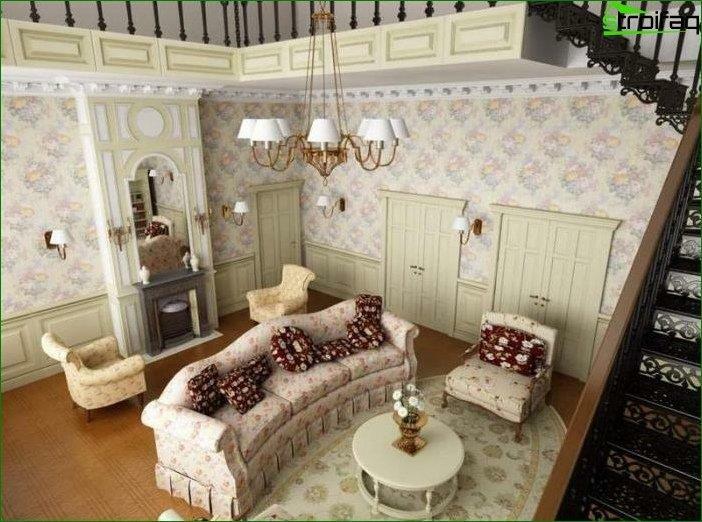 Be sure the room nezashtukaturennoy presence of a wall or a successful imitation in the wallpaper. 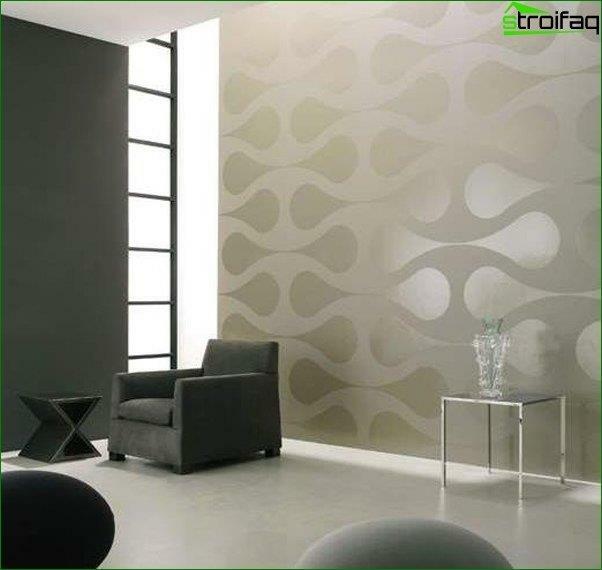 Sami wallpapers mimic natural plaster. The style of simplicity and nostalgia for the simple village life. 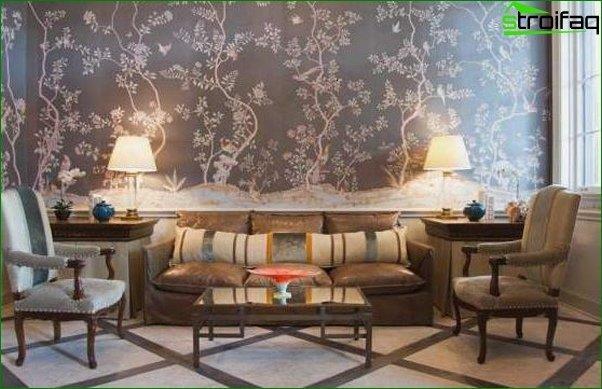 AND wallpaper They do not differ pretentiousness and complexity drawing. Light pastel colors in a cage strip, not striking geometric pattern or a modest flower. Location to all natural Japanesedefined style and the material from which made the wallpaper. This rice paper, silk. Depicted figures are always traditional, characteristic only of Japanese culture: fire-breathing dragons, cherry blossoms, cranes or characters. The color scheme, as well as life itself - calm, quiet, located to the rest. Read also about choosing the curtains for the hall. 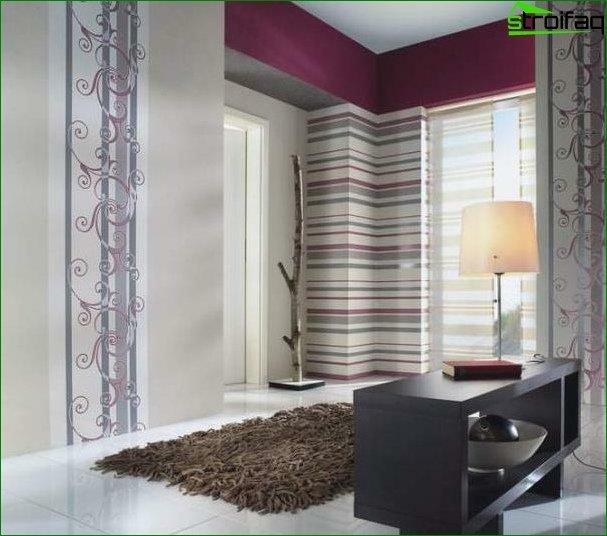 The choice of colors for the room to be wallpaperto pay special attention. 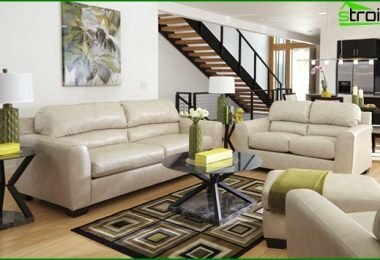 After all, each color has its own impact on the perception and properly matched, it can visually change the space or do not stay in the room very cozy. 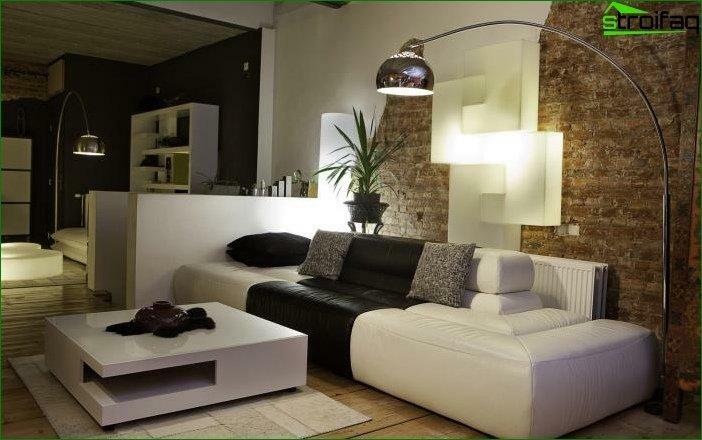 White - the color of active life-affirming symbolpurity and chastity. It is peace, peace. In its pure form it is rarely used. It has all sorts of shades, warm and cool. 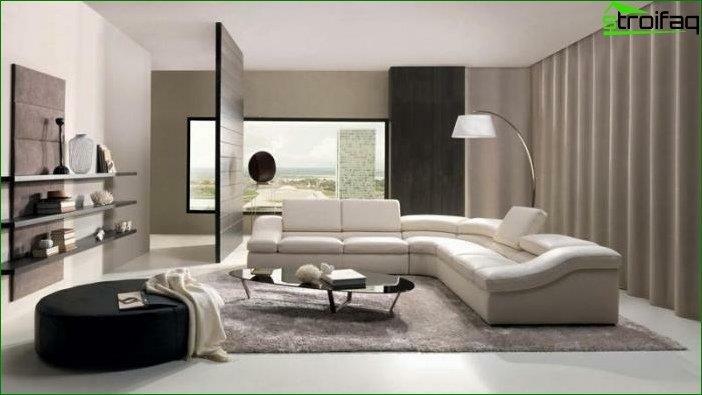 The interior is used as a neutral color, when the emphasis is placed on the furniture. Black - the color of the complex, a symbol of power. infinity symbol. 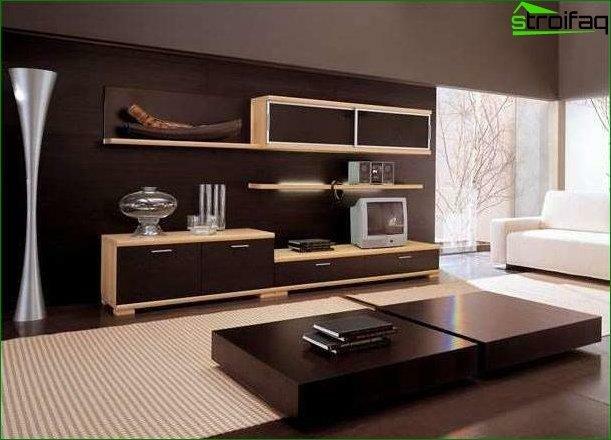 The excess of black in the room causes drowsiness. Pertinent in the bedroom rather than in the room. 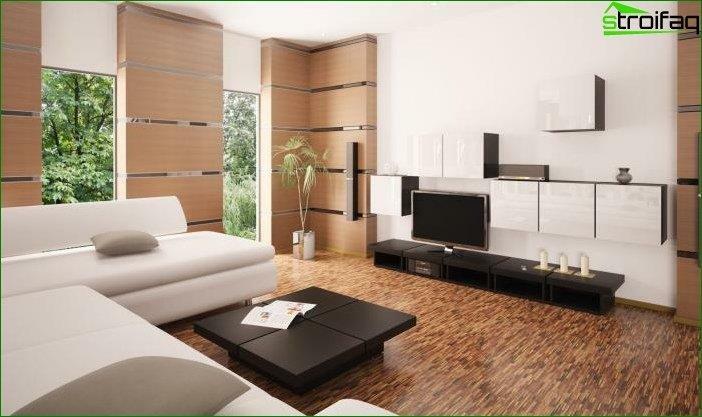 It allowed the combination of black and another color for bold decisions and a breakdown of the space. 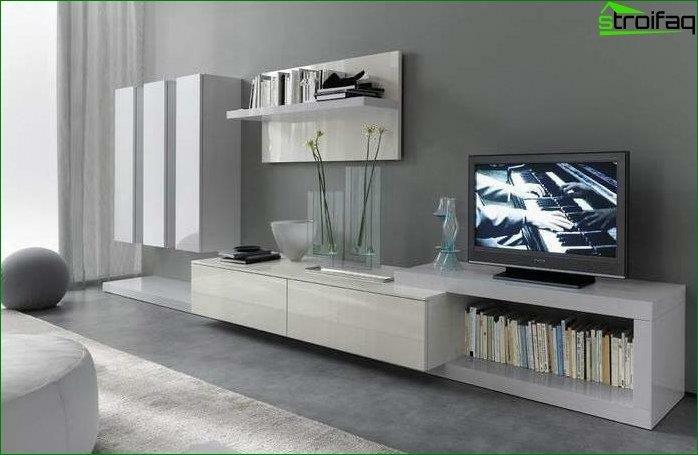 Grey - neutral, universal color, in tuneand harmonious with any other. Sam can be very interesting, if you create a mix of several of its colors or textures. Of all the colors has perhaps the largest number of colors. It may be a link between several incongruous colors. Red - the color of energy, momentum. Quickly tiring and causes anxiety, palpitations, increased blood pressure. Very hot color is considered a symbol of passion. The interior is a sign of wealth and luxury. It is recommended to use red color and all its spectral colors fragmentary, as the strongest accent. Orange - the most dynamic, fun. The effect is the same as that of red. More suitable youth. Purple depressed, evokes nostalgia,It is depressing the nervous system. Pure Purple is the color of loneliness. 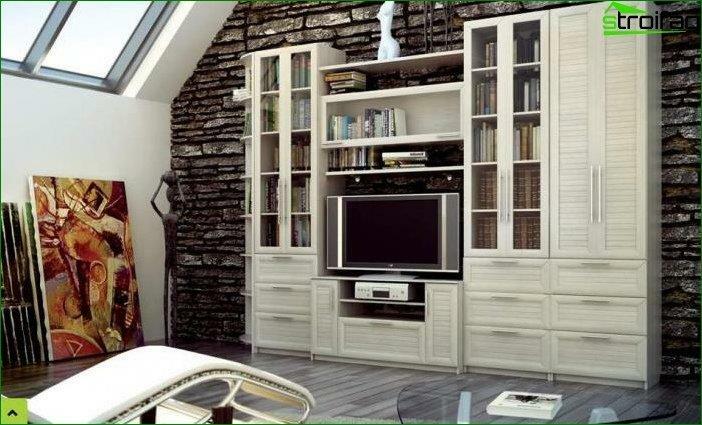 But this does not mean that it is necessary to abandon it in interior design. 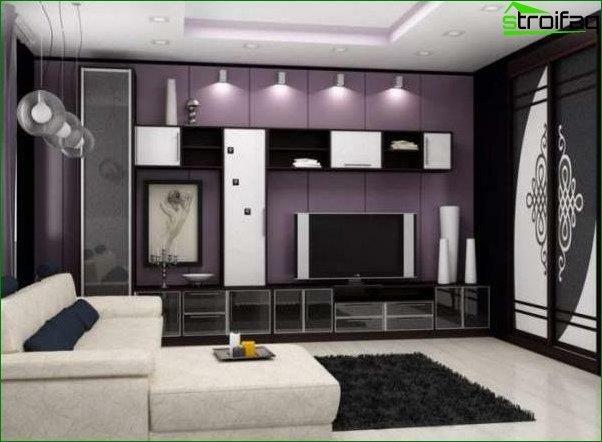 Shades of purple remarkable combined bold decisions with the other colors, more balanced and life-affirming. 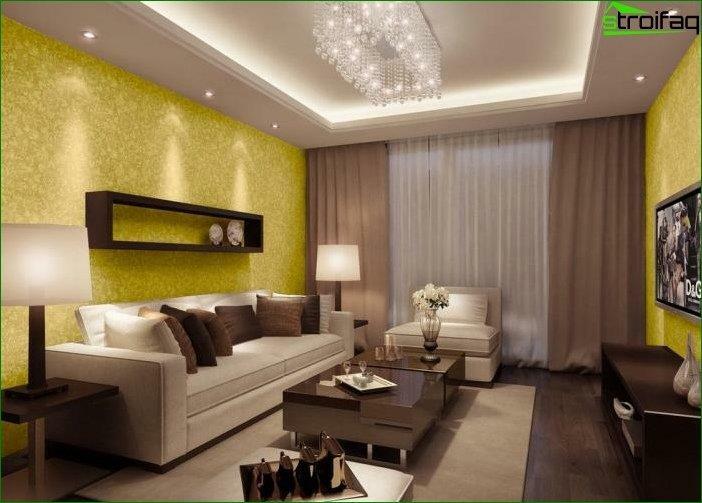 Yellow - a cheerful, optimistic, stimulates the eyes and nervous system. A good remedy for susceptibility to phobias and low self-esteem. Blue - cool, phlegmatic color. It relieves stress and blood pressure levels. The color of peace and tranquility. 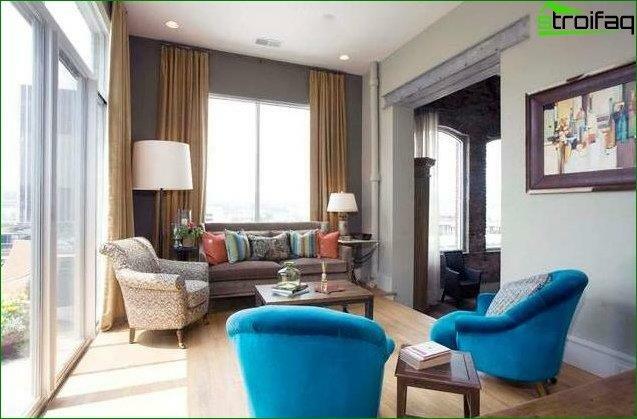 The rooms, oriented to the north,preference is given to the color palette of warm. 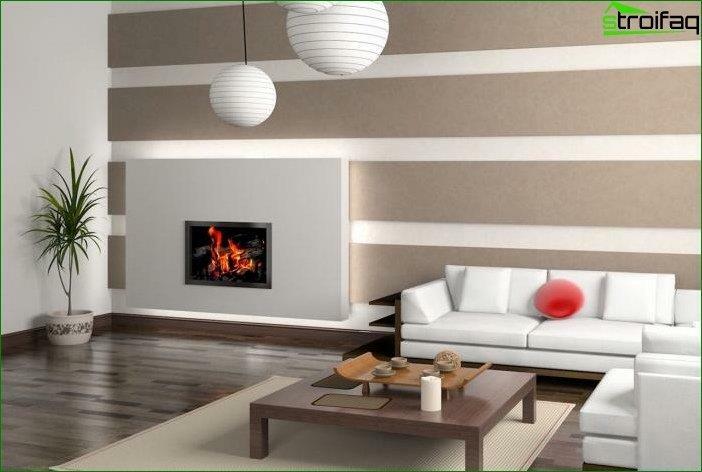 Warm colors will not only create a sense of warmth and comfort in the room, but also visually make the room more. Okleyte your room yellow, gold, coffee and orange wallpaper, and you immediately feel that the room was 5-7 degrees warmer. In the southern room, where so much heat isdilute it with cold shades of the color palette. It's all shades of blue and blue, and gray. Such rules should be followed in rooms facing east, south-east and south-west. 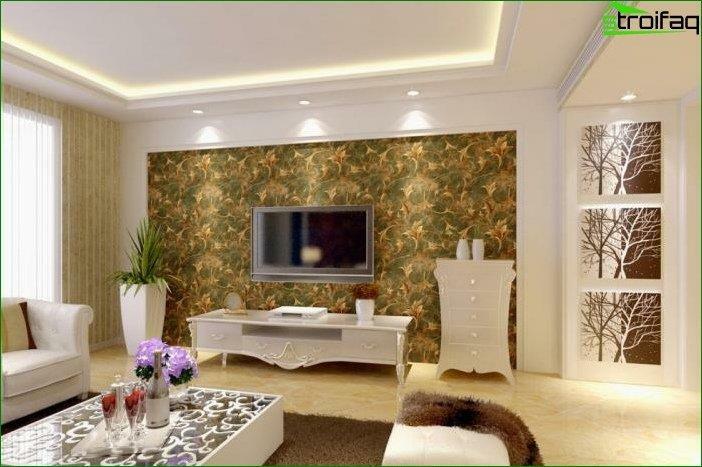 It is also important in such rooms paste the wall wallpaper does not fade. For human visual perception is very important. Sometimes he is guided only by them, to make an impression, to cheer up or enhance their performance. 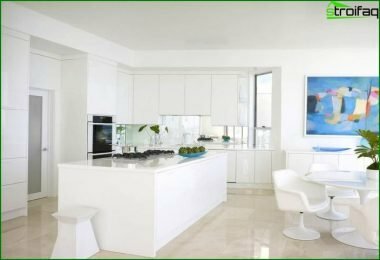 People have long noticed that the room with warm and light-colored walls, even in very cold weather seems warmer and more pleasant in the summer heat to hide in the room with cool colors. The temperature is the same, but his eyes cool. Every color, as a man, has a psycho. There are extroverts colors: yellow, orange. They give up their energy. And there are introverts. Blue, green, are a potential source of energy. 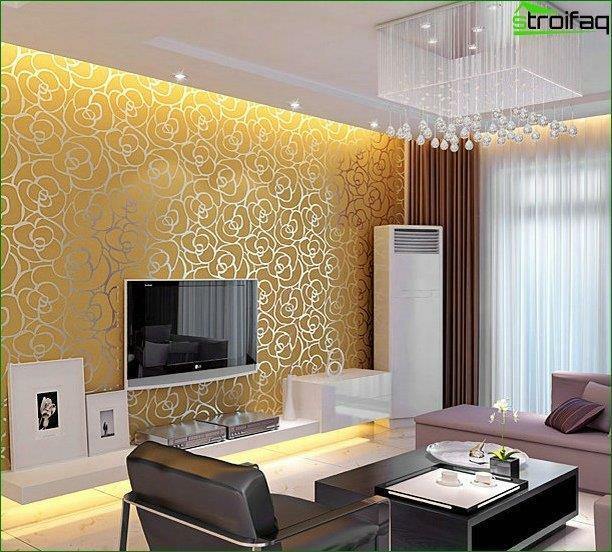 Only with the correct color of wallpaper, you will feel comfortable in the room. Sometimes the color corresponding to the psycho ownerpremises, strengthens its dominant quality. The yellow room sanguine or choleric may become more emotional, bad focus. Melancholic and phlegmatic in blue or green room will plunge into depression and discouragement. Because sometimes necessary to apply the law of physics that unlike charges attract each other, and to compensate for emotional calm blue, and a penchant for daydreaming yellow love of life. 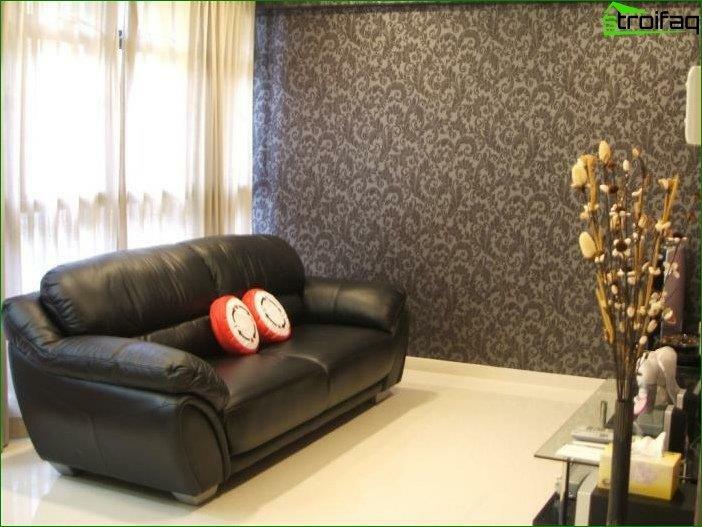 Some interior styles suggestObligatory use of combined wallpaper. 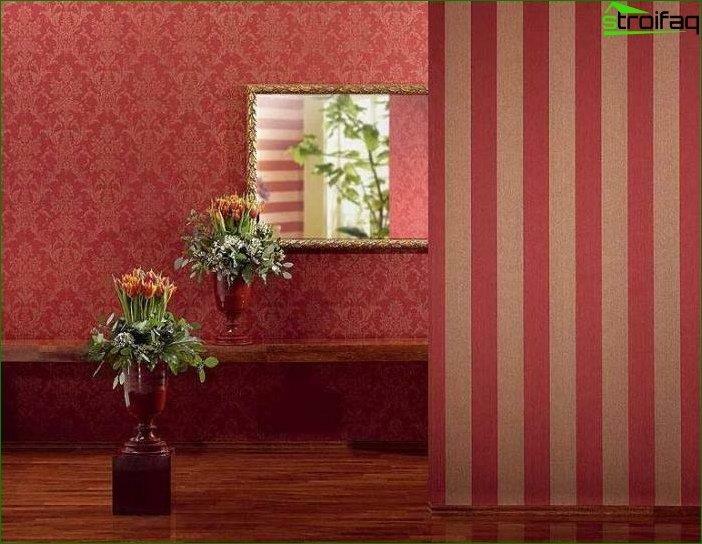 The Victorian style, for example, the walls covered with horizontal stripes of two congruent kinds of wallpaper, separated by a curb tape. 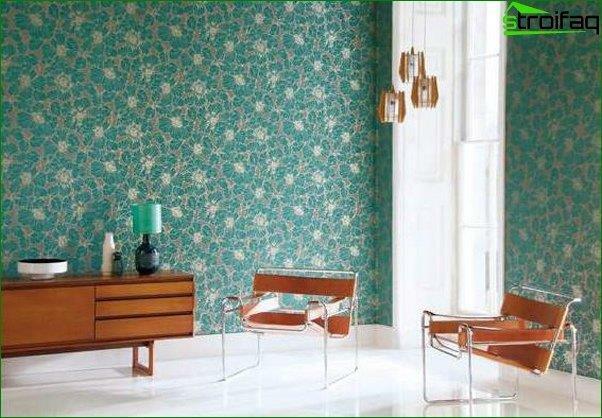 The combination of several kinds of wallpaper today -this is a wonderful option to show their individuality and show off the taste. 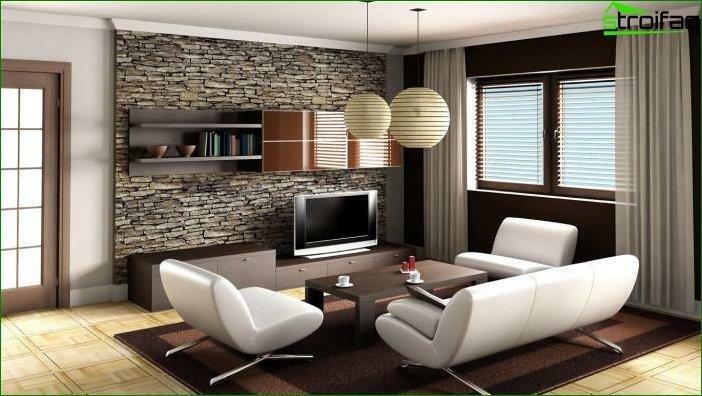 In modern design, you can see a combination of not only different colors but also of textures, patterns. 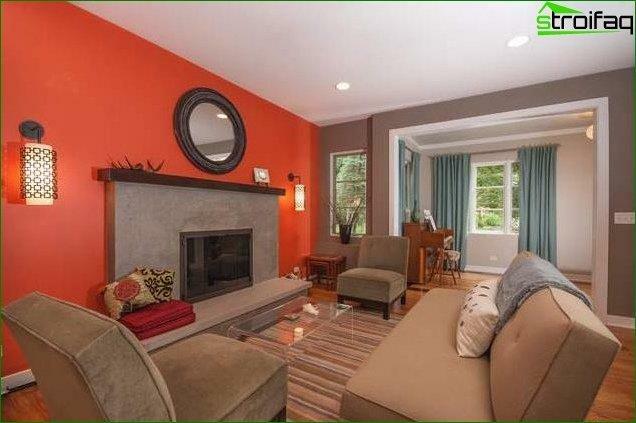 When using complementary colors should be careful, otherwise it may get very rich interior, quickly tiring eyes. Designers often use derivatives of the primary colors. 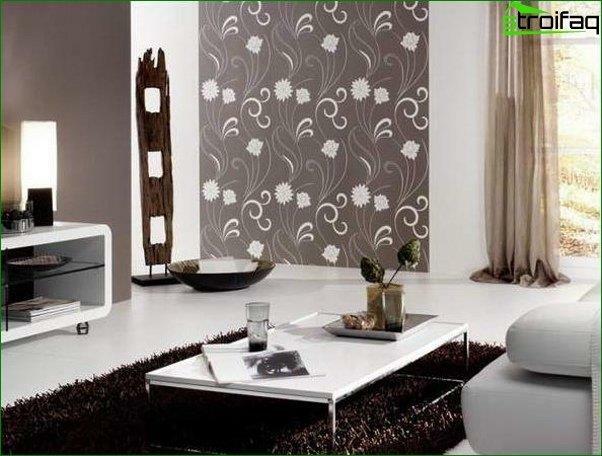 combination of several kinds of wallpaper with accents, crashing space. 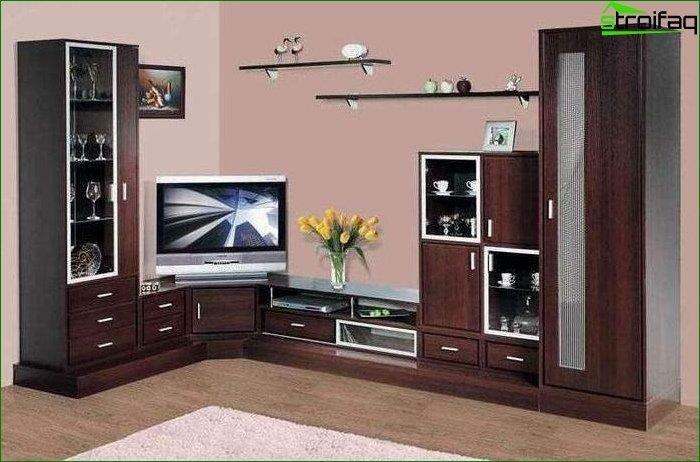 Do not be upset that a small room ingreatly restrict the flight of your imagination in their design. 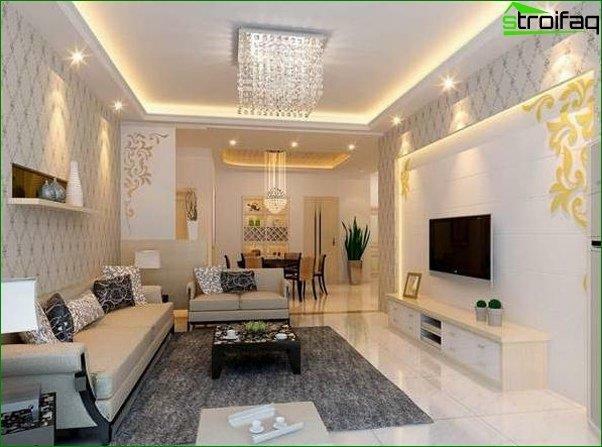 As they say - small but precious, because you can make a small room on the area of ​​ultra-modern room, comfortable for tenants and pleasant for guests. Colour. Usually, the focus in the colors of a given year is focused on the color of the Eastern calendar. This - the year blue horses, and therefore a blue color to a greater or lesser extent be present in the wallpaper. Optionally, it must be a pure blue. After all, there are colors that are based on blue. Green, for example. Drawing. More than ever fashionable patterns with floral ornaments. Texture. Volume, acting on the canvas wallpaper pattern. Smooth surfaces have long been a thing of the past. Wallpapers with thematic images, wallpapers. In addition to the wallpaper, the proposed theme of the manufacturer, you can buy the original on businesses, causing drawing to order. Now in vogue wallpaper depicting portraits. 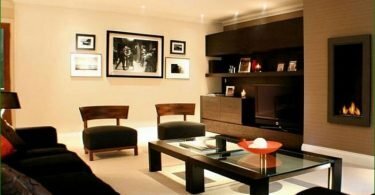 It may be well-known personalities, just pretty face or an image of one of the most successful pictures of family members. Photo wall very quickly won the favorof people. It is thanks to their huge range. In addition, they are relatively inexpensive and easy-to-glueing. 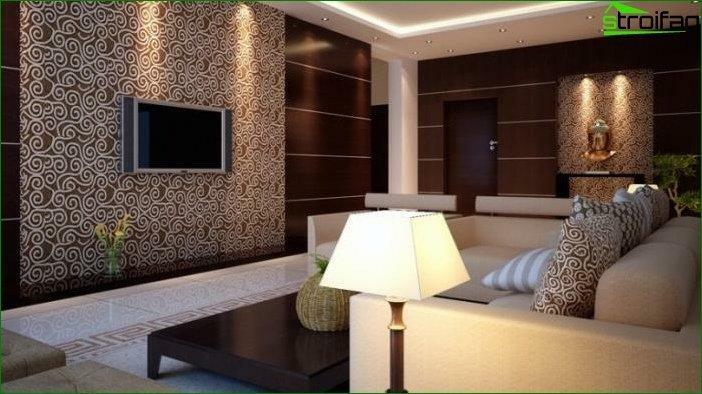 One needs only a little effort and accuracy that appeared on the wall panels with all kinds of images. Besides Mural good job of visual expansion of space and its correction. Today you can order wallpapers for individual sketch or photos. 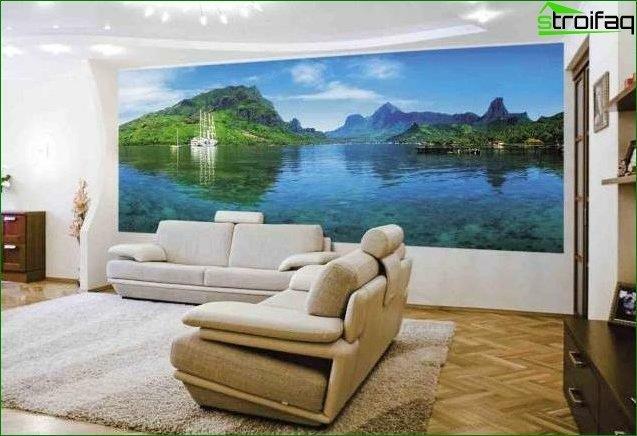 In addition to the usual paper, the durationthat life is not as great as we would like, and the quality of joints is poor, there are commercially available non-woven and vinyl wallpapers. 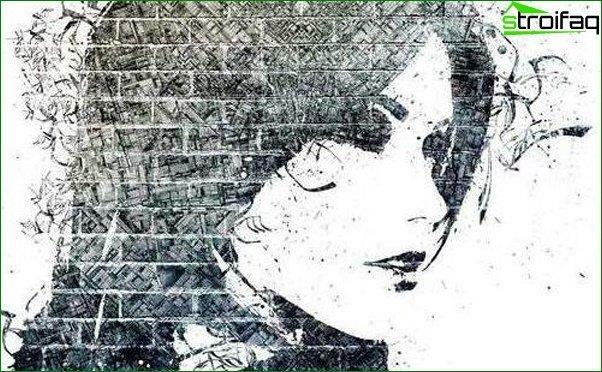 They are printed on a dense material with all kinds of textures: sand, stone, plaster, canvas. 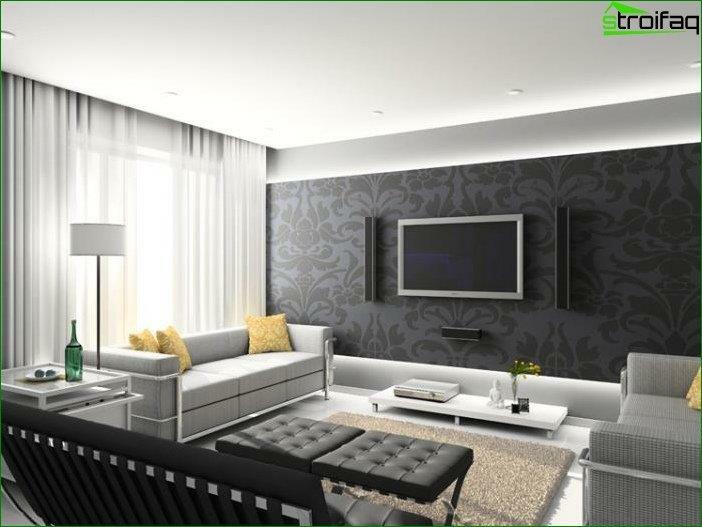 To continue photowall life to avoid them rubbing and soiling, on their surface is covered with a special varnish or laminating film. Application of the film to provide a better professional. This is a pretty difficult job and requires certain skills. 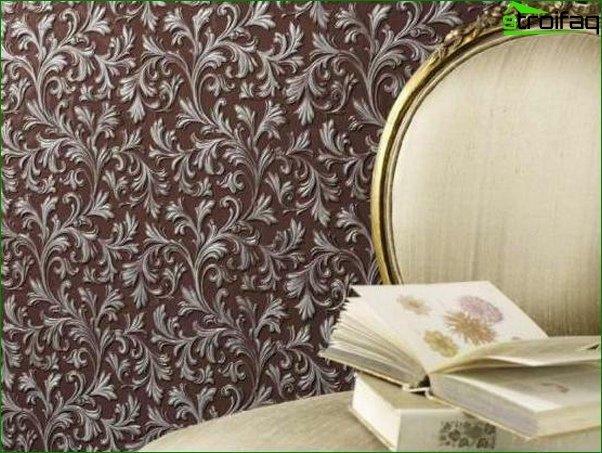 If your choice has fallen on a paper or non-woven wallpaper pokleit they can be on their own, looking at video course. 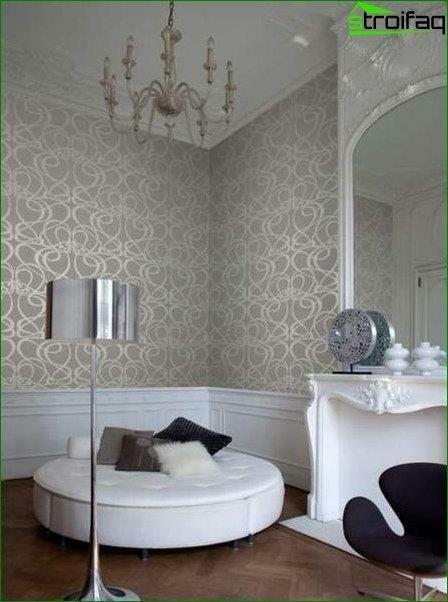 If you purchased metal, textile wallpaper, it is best to consult a specialist. For their gluing need certain skills and abilities. 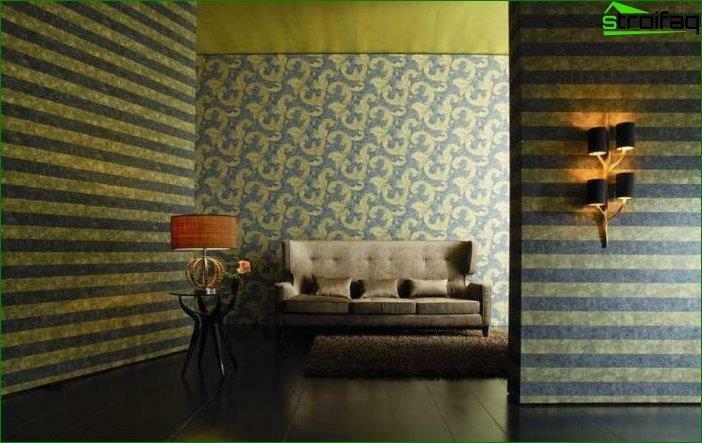 Select a wallpaper for the room - it is always veryfascinating and interesting process. One has only to remember that in a roll and on the wall, they can look completely different. And so if you can - try to expand the store next to at least two rolls, in order to understand how it looks harmonious pattern in the web, rather than a narrow strip of a width of just over half a meter. If you like the wallpaper that you feel a bit overloaded pattern - it does not matter. You can always combine them with others, tune in texture or color. 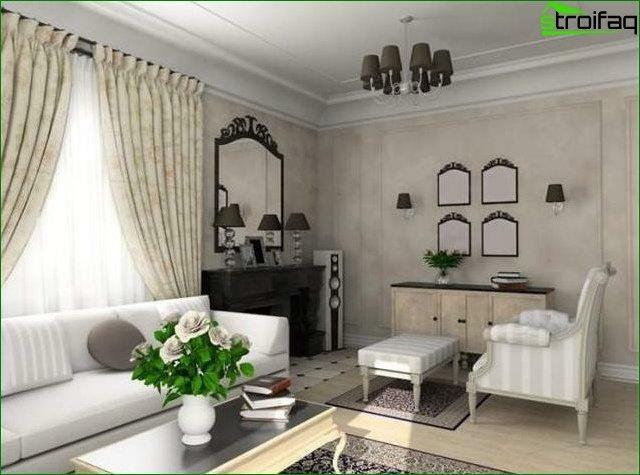 This is even better - the room with the design of the walls is certainly no one will.